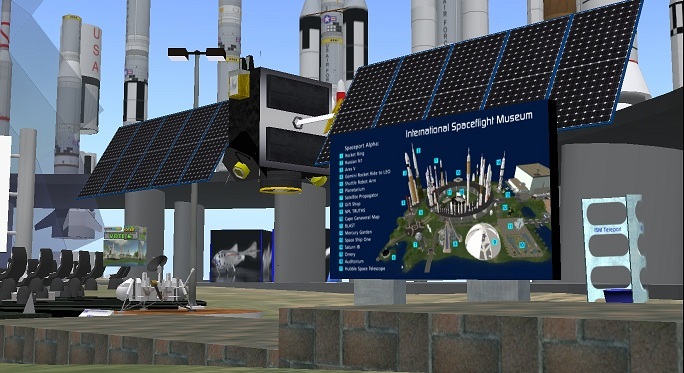 Spaceport Alpha, SciLands Second Life, SPNNews – R. Asimov Starsmith (SL) has modeled the Dawn spacecraft for the International Spaceflight Museum. While we wait for it to orbit Main Belt asteroid Vesta and get better images for the mural of our permanent exhibit, we’ve put our Dawn in a parking orbit on the walkway to the ISM auditorium stage. Here are more details on Dawn’s mission and powered-flight trajectory. This entry was posted on June 23, 2011 at 12:36 pm and is filed under event, SciLands, SL. You can follow any responses to this entry through the RSS 2.0 feed. You can leave a response, or trackback from your own site.